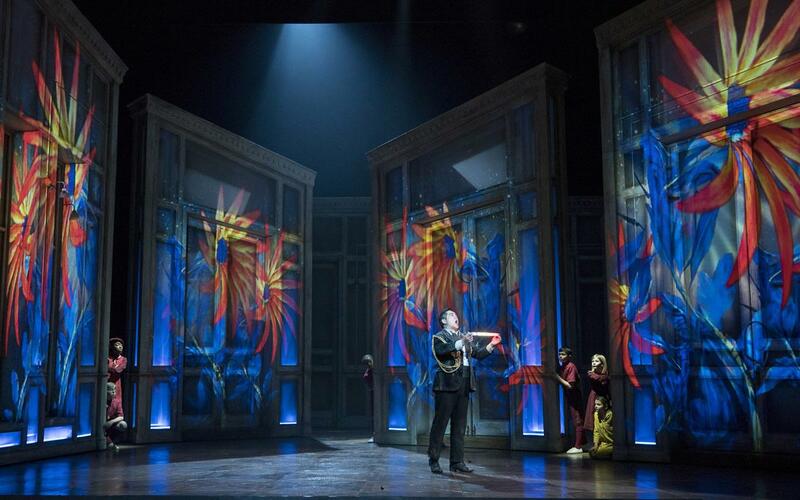 Review: The Magic Flute. Opera North. Nottingham Theatre Royal – East Midlands Theatre. The Magic Flute is the third most popular opera performed worldwide. Papageno’s rustic songs, and the famous trilling aria of the Queen of the Night, are widely-recognised, so that even if one has never seen the opera, Mozart’s music is ingrained as part of our cultural heritage. First performed in 1791, as with Shakespeare, one wonders how it can continue to entertain today? Opera North have grasped the opportunity to re-envision it with both hands and present a fantastical, beautifully crafted piece. As with many classic tales, the story itself is rather convoluted. A young girl falls asleep and dreams of an imaginary world. The handsome Prince Tamino is pursued by a monstrous serpent. Three ladies, servants of the Queen of the Night, slay the monster, and show the Prince a picture of the Queen’s daughter, Pamina, with whom he immediately falls in love. Tamino vows to rescue her from Sarastro, the Priest of the Sun, and the three ladies give him a magic flute to help him. Papageno, a bird-catcher, is tasked with accompanying him. Tamino discovers that Sarastro has kept Pamina hidden from her mother for her own safety, and he must now undergo various trials to prove his love. After a brief battle, Sarastro defeats the Queen of the Night and the sun rises on a new dawn. And that’s the short version. Beyond the complex detail of the story, larger themes emerge. This is a fable of contradictions and contrasts, and the murky world created where they meet. 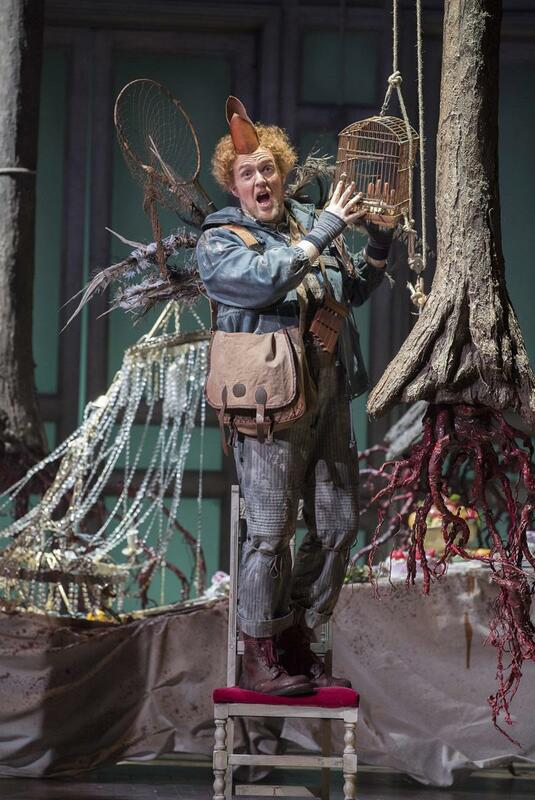 Papageno is a bird-catcher, a crude Irish peasant plucker of birds, with hobnail boots, a denim jacket and a wild sprouting of ginger curls. In this instance, an ‘everyman’ who just wants a quiet pint and a girl of his own, and who is lost in this world of myths and death-defying trials. Gavan King in this role has brilliant comedic timing, and even deals with a (friendly) heckler with a casual riposte. With a beautifully warm tone and impressive diction, the audience warms immediately to his charm, and he provides the key to our involvement in the story. Papageno’s natural environment is the forest, a magical place, bathed in violet moonlight, with ethereal beech trees hanging mid-air, their roots red entrails, having been plucked from the earth. This natural world is sharply contrasted with the formal world of the temple of Sarastro, whose sparse surroundings and repressive, orderly uniforms exhibit the desire for control and conformity. 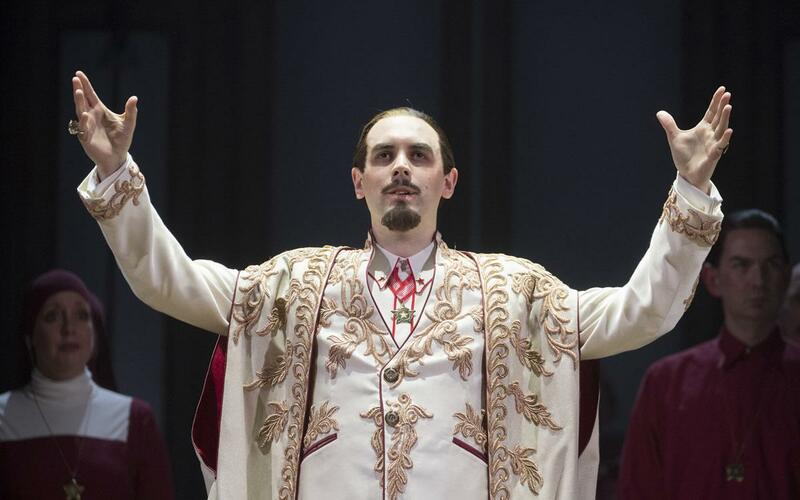 The costumes here are stunning: a whole community bedecked in blood red, with its highest commanders swathed in folds of heavy white drapes with red linings. Blood or suffering sheathed in purity. The details are beautiful – an asymmetric cut coat with off-set gold buttons and crisp red piping – it echoes the traditional, yet also feels timeless and modern. 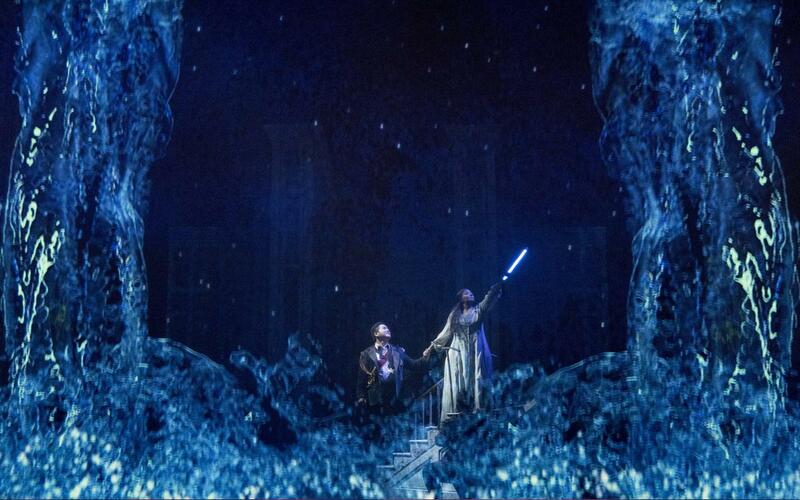 Set and costume Designer Colin Richmond makes the whole production a visual feast. 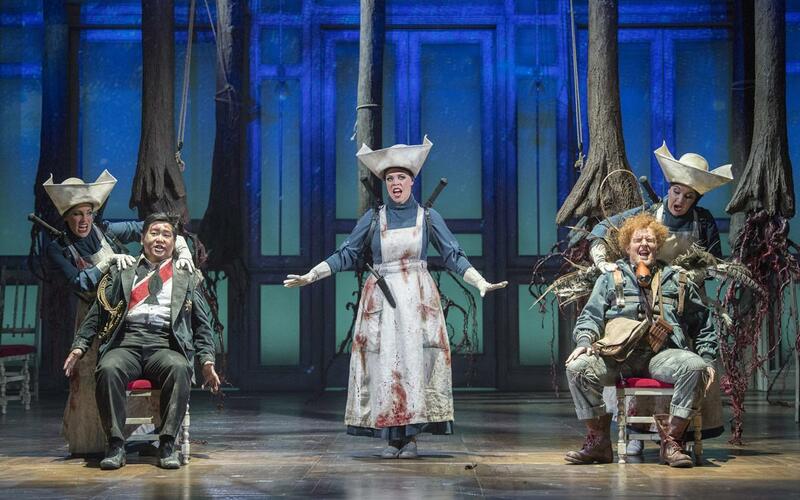 The three ladies are a cross between nursemaids and avenging angels of death, with light sabres as weapons and blood splattered aprons, looking spookily like the recent television adaptation of The Handmaids Tale. The scenery consists of a series of white casement windows which become walls, sometimes moved to create a vast ballroom space, sometimes overlapped and protruding, representing Pamina’s cramped imprisonment or a bare corridor. The fluidity of the walls and their ‘blankness’ creates an unsettling, dream-like quality in itself. The translucent material used as ‘glass’, allows Chris Davey’s lighting plan to suffuse through it to great dramatic effect, creating swathes of other-worldly colour and providing a surface on which digital projections are made. Designed by Douglas O’Connell, these allow the enchanting elements to be heightened further, with luscious tropical flowers unfolding, and elements of fire and water filling the stage during the ‘trials’. Imagine this cornucopia of optical delight, and then infuse it with the most exquisite singing and a sublime orchestra. Kang Wang as Tamino is a reluctant hero, his wonderfully lyrical arias apparently effortless and relaxed. 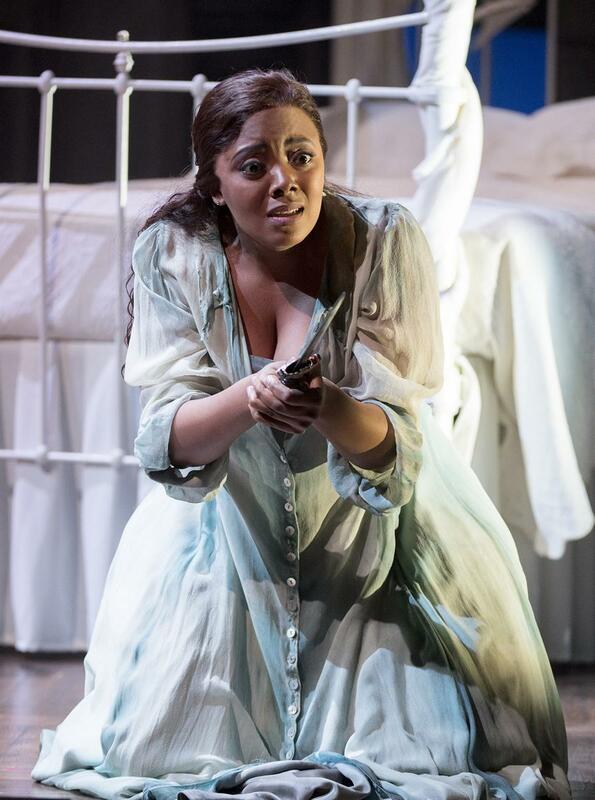 Pamina is performed by Ellie Laugharne in Nottingham, and she brings spirit and energy to the role, her elegant soprano voice caressing the softer melodies. The pinnacle of Mozart’s music comes with the Queen of the Night’s furious instruction of her daughter to kill Sarastro. So desperate is she to regain her powers, she is rendered almost speechless, and the staccato altitudinous notes represent this suppressed fury. Samantha Hay achieves a breath-taking, flawless performance, giving the role depth and expression beyond the villainous archetype. The orchestra, with over 40 members, deserves to be listened to without the distraction of all that is absorbing our visual senses. George Jackson conducts at this performance, and keeps the energy high, and the sound articulate and expressive. From the vantage point of the dress circle, it is always an additional pleasure to be able to see the orchestra play. Newcomers to opera, like myself, will be in awe at the purity and strength of sound achieved by the singers projecting their voices without the aid of microphones. Likewise, the large orchestra is beautifully balanced with the voices and this creates an enveloping, natural sound which audiences subjected to over-amped musicals will be astonished by. The large chorus, made up of adults and children, is another bonus, giving yet another engaging dimension to the story. 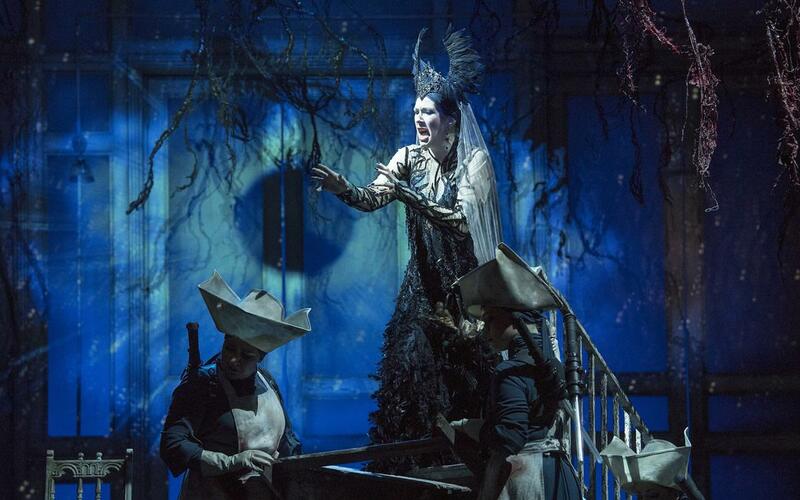 This production of The Magic Flute by Opera North is simply glorious. Every opportunity to make it live it and breathe has been taken, every character rounded out, every technical component aiding and abetting its exaltation. James Brining, Artistic Director of Leeds Playhouse, is at the helm and it seems clear that his focus has been on extracting the dramatic expression and the story-telling in the production. This production at Nottingham Theatre Royal is sold out but Opera North’s new season has just been announced, and to anyone and everyone who loves the theatre, I would urge you to book ahead for future productions. Opera may feel like something distinct and ‘for others’, challenging even, but Opera North have made it accessible, wondrous, a joy to behold. Promo: Derby Theatre. Much Ado About Nothing. Northern Broadsides and New Vic Theatre. Promo: Barber Shop Chronicles to play at Curve Leicester on UK tour. 3-6 April.